Gennady Golovkin (38-0-1, 34 KOs) made his 20th successful title defense on Saturday night in defeating the game but limited replacement opponent Vanes Martirosyan (36-4-1, 21 KOs) by a 2nd round KO on Saturday night in front of a sparsely filled StubHub Center in Carson, California. 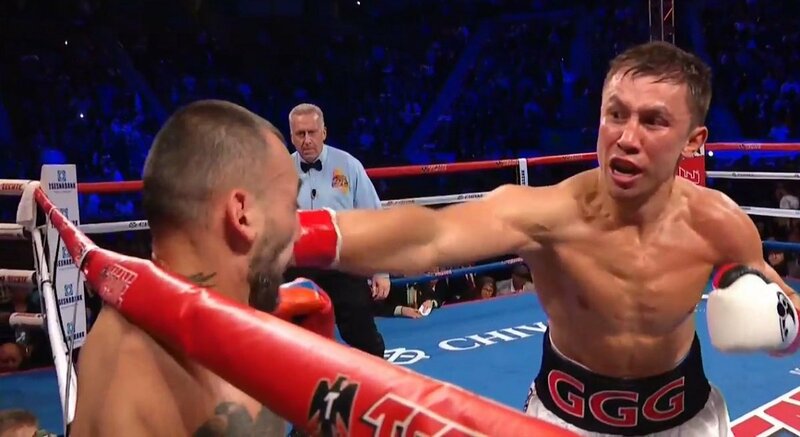 Golovkin hurt Martirosyan with an uppercut in the 2nd round. Golovkin then followed with a huge left hook that shook Martirosyan too his boots. Moments later, Golovkin hit him with three flush shots to the head that sent him down. Golovkin threw a shot while Martirosyan was falling. It didn’t matter though. Martirosyan was down face first on the canvas badly hurt and unable to get up to his feet. Earlier in the 2nd round, Golovkin had clipped Martirosyan with an uppercut that caused him grab and hold. That shot was the first really hard punch that Golovkin had thrown in the fight, because in the first round he had done largely nothing. Martirosyan was getting the better of the action with his jabs and right hands. After a less than impressive 1st round, Golovkin came out looking to get even with Martirosyan in round 2. It was an entirely different Golovkin that we’d seen in the previous round. Everything Golovkin threw had hurtful intentions. Martirosyan showed a good chin to take some of the big punches that Golovkin hit him with. A left hook that Golovkin hit Martirosyan with would have knocked out a lot of fighters, but he took the punch. Granted, it was the beginning of the end for Martirosyan, but he still took the shot. After Martirosyan was hit with a monstrous left hook early in the 2nd, he could only muster a couple of more decent shots before Golovkin unloaded on him for the knockout. The final knockout sequence in the 2nd saw Golovkin land a jab followed by an uppercut and combination. It looked really smooth from Golovkin. Golovkin’s punching power looked as good as ever. Golovkin did not look good in the 1st round, but when he started letting his hands go in round 2, he was devastating. It didn’t matter that Golovkin missed some of his shots. The ones that he did land were more than Martirosyan could handle. If Golovkin fights like this in his rematch against Saul Canelo Alvarez in September, he’s going to knock him out for sure. Canelo won’t be able to take these shots no matter how bulked up he is. Golovkin weighed 173 lbs. tonight compared to Martirosyan’s 170. It’s unclear how heavy Canelo was for the GGG fight last September, because he doesn’t weigh-in on the night of his fights for HBO. I think it’s important for Golovkin to fight 3 times a year so he can stay sharp, because just fighting twice a year isn’t enough for him to keep his accuracy his shots at a high level. Last year, Golovkin seemed to be negatively affected by his long stretches of inactivity while trying to negotiate fights with Daniel Jacobs and Saul Canelo Alvarez. Golovkin then had to sit out of the ring for 8 months because Canelo didn’t want to fight for the remainder of 2017. In the end, Canelo tested positive for clenbuterol and Golovkin was stuck with Martirosyan was his replacement opponent.